Like erecting a cellular telephone tower 22,300 miles tall, the U.S. Navy's first-of-its-kind mobile communications satellite rose high above Earth tonight to provide 3G voice, data and video services to military troops on the move. Soaring away from Cape Canaveral's Complex 41 at 5:15 p.m. EST (2215 GMT), the Atlas 5 rocket sped towards space carrying the Mobile User Objective System 1 satellite. MUOS 1 became the heaviest payload ever launched by an Atlas rocket in more than 600 launches under the venerable booster's name, weighing nearly 15,000 pounds. And to heave the craft into a lofty geosynchronous transfer orbit, the Atlas 5's largest, most energetic configuration previously used to hurl space probes toward Jupiter and Pluto was tapped for the mission with five forceful solid rocket boosters flanked around the vehicle. What's more, the launch also marked the milestone 200th flight for the dependable Centaur upper stage, which conducted three critical firings over the course of three hours to position MUOS 1 into the proper orbit to score a successful launch. The sophisticated MUOS system -- to be fully assembled with four more launches over the next few years -- was designed around the commercial third-generation cellular telephone architecture to substantially increase the number of users and amount of communications that can be routed to military forces. The satellites will ring the planet and provide capacity, availability and global coverage for mobile military communications like never before. "If you think of the spacecraft as a cell tower in the sky, each of the satellites represents a cell tower," said Capt. Paul Ghyzel, program manager of the Navy's Communications Satellite Program Office. From its eventual spot in geosynchronous orbit, matching Earth's rotation to hover in a parking spot 22,300 miles up, the expansive footprint of MUOS 1 will cover a huge swath of the planet to serve ships, submarines, aircraft, land vehicles and terminals in the hands of troops. Initial testing of the craft will be performed later this spring over the mid-Pacific Ocean in view of a Hawaiian ground station. However, the final operational position in space and what geographical area of the globe the craft will cover hasn't been chosen yet. 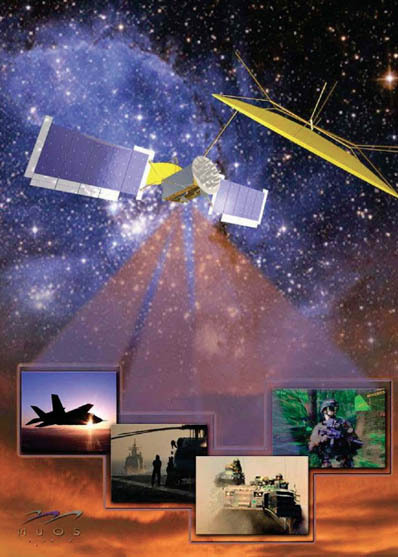 MUOS will offer 10 times greater communications capacity to the mobile warfighter over the Navy's current generation of Ultra High Frequency Follow-On spacecraft to relay narrowband tactical information such as voice calls, data messaging, file transfers and email on rates of up to 384 Kilobits per second. "Utilizing commercial 3G cell phone and satellite technology, MUOS will provide warfighters 'on the move' point-to-point and netted communications services at enhanced data rates and priority-based access to on-demand voice, video and data transfers," said Mark Pasquale, Lockheed Martin vice president and MUOS program manager. 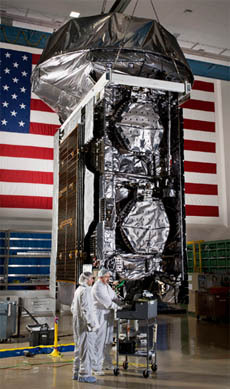 The UHF communications routed through previous Navy satellites and soon MUOS 1 provide command and control between combatant leaders and their warfighters, connectivity to tactical forces, communications for Special Operations and support to rapid deployments of land, air and naval forces worldwide. Military officials have stressed the need for additional UHF channels to supply the diverse users of the system, something that MUOS is designed to give. "The UHF spectrum is the military's communications workhorse because it is the only radio frequency that can penetrate jungle foliage, inclement weather and urban terrain," says the Navy. Approximately 67,000 UHF user terminals are deployed across the military branches serving around the world, according to the Navy, and many of them are carried deep into theaters of operation. MUOS also enables users to communicate with smaller devices, like "rugged smartphones" in the hands of troops, unlike the bulky gear needed to talk with the Ultra High Frequency Follow-On (UFO) satellite fleet. "In the current UFO environment, ground users must be stationary with an antenna positioned directly toward the satellites to send out information. With MUOS, not only will users be able to connect with the satellites while on the move, the satellites will be connected to ground-based receiving stations that provide connectivity to the Global Information Grid, enabling users to send and receive data, calls and video worldwide," said Pasquale. "The system transitions from a circuit switch to an all-IP dynamic network which supports on demand, ad-hoc and priority based planning. MUOS also provides users with predetermined priority which allows bandwidth to be shared efficiently." At the heart of the MUOS satellite's communications payload are two gold mesh antenna reflectors, built by Harris Corp. Coverage to legacy users will transmit through a 17.7-foot-diameter reflector on the bottom of the craft and the advanced, multi-beam features of MUOS to significantly increase the transmission capacity over the Navy's previous satellites will use a large 46-foot reflector atop the satellite. "MUOS is designed to allow backward compatibility with legacy UHF terminals while providing a next generation waveform to support 'communications on the move' capabilities," said Pasquale. "This ensures that legacy systems remain compatible with the MUOS architecture, while offering the technological advancements needed by its military users." Lockheed Martin is producing five MUOS satellites -- four primes and one in-orbit spare -- to replace the Navy's Ultra High Frequency Follow-On spacecraft that were launched by Atlas rockets from 1993 through 2003. Eight of the 11 satellites remain in operation today. 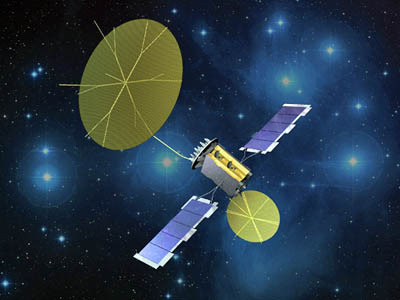 "A single MUOS satellite provides more communication access than the current UHF constellation. This capability is critical to the U.S. military because they depend on reliable, targeted communication to complete missions and to protect service members worldwide," said Pasquale. "MUOS is designed to support those requirements by providing users narrowband communications with greater mobility, higher data rates and improved operational availability." 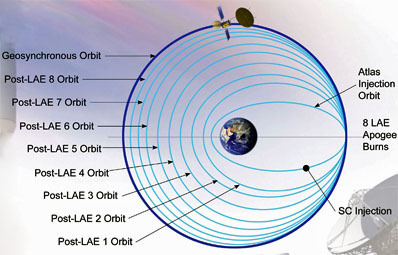 MUOS 2 will go up in July 2013 and the subsequent two primary satellites and one orbital spare will follow at a launch rate of approximately one per year. "The second MUOS space vehicle is currently undergoing environmental testing, which will validate its performance in a simulated space environment. The third spacecraft is entering environmental testing, and the fourth and fifth MUOS satellites are steadily progressing in the production flow," said Pasquale. In its launch configuration atop the Atlas rocket with the two power-generating solar arrays stowed on the sides and the umbrella reflectors folded up, MUOS stood 22 feet tall, 12 feet wide and 6 feet deep. The craft was built on Lockheed Martin's A2100 satellite design used by dozens of previous communications spacecraft. The constellation's orbital zones include the vast Pacific Ocean, the continental U.S. coverage area, the Atlantic Ocean region, plus two positions over the Indian Ocean and the Middle East. The system is expected to be fully operational for global service in 2015. "Just like your commercial cellphone providers out there, they don't build all of their cell towers in a day. They come on in a sequence, same with the satellites," said Ghyzel. With its kerosene-fed main engine rumbling to life, the five solid-fueled motors strapped to the first stage ignited to propel the tower 206-foot-tall rocket into the Florida sky with a crackling thunder pounding across the spaceport. Less than five minutes later, the solids and bronze lower stage had jettisoned and the cryogenic Centaur upper stage, making its milestone 200th flight, lit the RL10 main engine to continue clawing toward orbit. A preliminary parking perch of 104 by 388 statute miles, tilted 28 degrees to the equator, was achieved just over 12 minutes into the launch as the Centaur shut down the engine and entered a brief cruise across the central Atlantic. A typical Atlas 5 ascent to geosynchronous transfer orbit, the standard dropoff point for communications satellites, uses just two firings by the Centaur to achieve the highly elliptical, egg-shaped orbit to deploy the payloads. From there, the satellites use their own engines in the subsequent days to fly into the operational locations 22,300 miles above the equator. 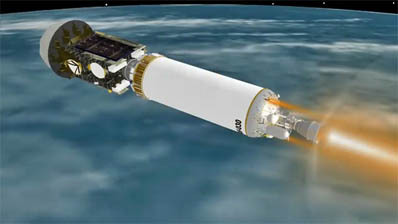 But the sizable MUOS drove planners to create a three-burn launch profile for the hefty payload to use all of the available performance from the Atlas-Centaur that in turns saves the satellite's precious onboard fuel supply for maneuvering over its 15-year life. "The MUOS 1 mission represents an excellent example of the performance and mission design capabilities of the Centaur," said Jim Sponnick, United Launch Alliance's vice president of mission operations. "Our customers for this mission asked for a mission design that would launch this very heavy and capable satellite in a manner that would minimize the amount of energy (and propellant) that the satellite would have to consume to position itself into the final geosynchronous orbit. Considering all of the commodities and capabilities of the Centaur, our mission design team developed this three-burn mission profile to provide an optimal solution for the MUOS customer." Just off the western coast of Africa, the Centaur main engine was restarted about 20 minutes after launch to propel MUOS to the second step on its way to the planned orbit. This six-minute burn put the rocket into a 120 by 21,400 statute mile orbit inclined 26 degrees. Then began a lengthy coast away from the planet for two-and-a-half hours, flying to a point about 17,000 statute miles above the far eastern Indian Ocean where the final burn would occur. "The three burn mission design for MUOS provides 1,000 pounds greater lift capability than a conventional 2-burn geosynchronous transfer orbit," said Sponnick. One final push was given nearly two hours and 57 minutes into flight to raise the orbit's low point and reduce the inclination closer to the equator. The burn, lasting less than a minute, placed the payload into a 2,150 by 22,237 statute mile orbit at 19 degrees inclination. 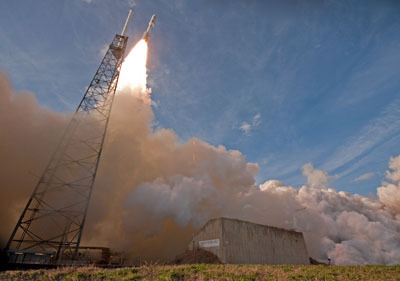 The satellite separated from Centaur at 8:16 p.m. EST (0116 GMT) to complete a highly successful launch, the first of 2012 for Atlas and 29th overall in the program's 9-year history. Ground controllers established contact with the satellite to begin what's expected to be a three-month process of maneuvering MUOS 1 into geosynchronous orbit, deploying its power-generating solar arrays to span more than 90 feet, unfurling a pair of umbrella-like antenna reflectors on boom assemblies and fully checking out the onboard communications equipment. Eight orbital raising burns are expected over the next 10-14 days, followed by the test program that Lockheed Martin will perform, Ghyzel said. The military will take control of the satellite in about 90 days to conduct its own acceptance evaluation before the craft enters service. Which of the available five orbital zones MUOS 1 will be placed in has not been determined. "We're in close coordination with the user community with U.S. Strategic Command. The final decision on where this satellite, No. 1, will go hasn't been made yet," Ghyzel said.